Having too many unnecessary things around your home is not as rare today as it once was – people of the past seemed to have only what they really needed and weren’t as wasteful as we are today. It’s about the philosophy of life and the fact that people today rarely throw away their belongings, even when not using them. However, recycling is always a good option and, with a pinch of creativity, you can make wonders with old things such as old car tyres, so here are a few ways of modifying them. Old tyres can come in handy when making various decorations for your garden – they can be colored, bended, cut and pulled in a million different ways and creative people can turn them into all sorts of fun objects. Those include rubber birds and animals, palm trees, bike stands, even patio coffee tables and baskets for your fruit, magazines and wood. You can easily turn your old tyre into a flower pot. Just wash it thoroughly, paint it and pick a spot where you want to place your flowers. 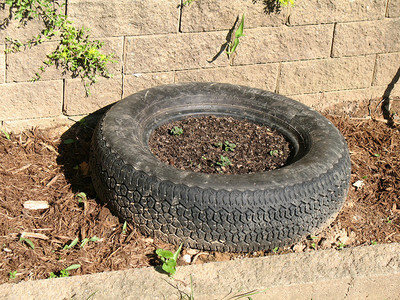 Simply lay the tyre on the ground and fill it with soil and plant your flowers, transforming your recyclable into a flowerpot. Additionally, you can make several vertical cuts and pull out the remaining parts, thus creating a sort of a decorative jardinière where your flowers are going to be visible the most. If you really enjoy flowers, you can also try this – don’t put them on the ground, but rather attach them to a chain hung on patio or dock beams. This way, you will get a nice addition to your outdoors and the flowers will be accessible for easy watering. You can even mount this decoration onto a wall and let it hang from there, or, moreover, wrap the chain around a branch in your garden and combine flowers with trees. Finally, you can cut a tyre in half horizontally and get two great pots from a single thing you initially wanted to throw away! 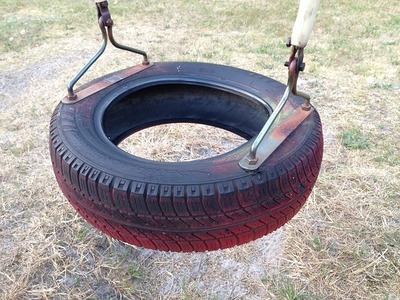 You can convert tyres into a source of enjoyment for your children. Following the same instructions as with the aforementioned flowerpot hanging from a tree, you can create a children’s swing out of an old tractor tyre. All that needs to be done is make a hole in it, wrap an extra-strong chain around the tyre and attach its end to a tree or a construction beam, and your children are going to adore this improvised swing. Or you can construct a sort of an outdoor training course for them – they will love crawling through the tyres, climbing them and jumping over, and this provides great training sessions beneficial to their health. shouldn’t just dump them anywhere because it’s not eco-friendly and can even get you into trouble. Options are limitless, so get to work today and give them a new meaning and life as a garden decoration, the only thing limiting you is your imagination.